Official announcement of a 101-unit limited run is expected this week. At the end of last year, Aston Martin CEO Dr. Ulrich Bez indicated that a roadster variant of the V12 Vantage would materialize in 2012. Some sources predicted it would debut at the Geneva Motor Show, but that expo came and went with no roadster in sight. The British supercar manufacturer is now expected to formally announce the twelve-cylinder convertible later this week. But before it does, a website privately dedicated to the vehicle has apparently obtained early images and details. The V12 Vantage Roadster is fully expected to use the same 6.0-liter V12 as the existing coupe. That in itself is no slouch, packing 510 horsepower and 420 lb-ft of torque, good for a top speed of almost 190 mph and a 0-62 time of 4.2 seconds. 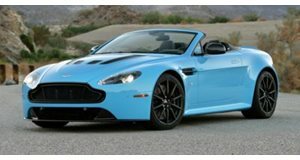 Compared to the V8 Vantage Roadster, the V12 model receives a revised trunk lid with rear spoiler, carbon-fiber side strakes and mirror caps, new forged alloys, and specific exhaust pipes. Aston also modified the V12 Vantage&apos;s suspension in order to handle the added weight of the folding soft top and structural reinforcement. Inside, black plastic is replaced with glass switches and carbon/black trim detailing. A Carbon Interior Pack is also being offered that adds a carbon-fiber center console fascia and gearshift base plate. Production of the Roadster is tipped to be limited to 101 units and commence at the end of the year, with select clients having reportedly already placed their orders for the latest drop-top Aston. Check back for official confirmation in the coming days.